This page covers advantages and disadvantages of Plasma Arc Welding and Arc Cutting. It mentions advantages of Plasma Arc Welding/Cutting and disadvantages of Plasma Arc Welding/Cutting. 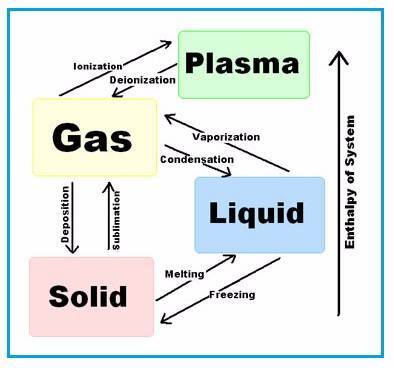 As shown in the figure, there are four types of matter solid, liquid, gas and plasma. The figure depicts how one matter is obtained from the other and vice versa. ➨Any metals can be cut. ➨The cutting is faster (about 5 to 10 times) than Oxy-fuel. ➨Higher thickness ability of 150mm. ➨Difficult to develop sharp corners. ➨Smoke and noise gets generated. ➨The method often results into burr. ➨High initial cost of investment. ➨Torch design allows better control of arc. ➨This method provides more freedom to observe and control the weld. ➨The higher heat concentration and plasma jet allows faster travel speeds. ➨The high temperature and high heat concentration of plasma allow keyhole effect. This provides complete penetration with single pass welding of many joints. ➨Heat affected zone is smaller compare to GTAW. ➨It produces wider welds and heat affected zones compare to LBW and EBW. ➨Plasma welding equipments are very costly. Hence it will have higher start up costs. ➨It requires training and specialization to perform plasma welding. ➨It produces ultraviolet and infrared radiation. ➨The method produces higher noise on the order of about 100dB. ➨The torch is bulky and hence manual welding is bit difficult and requires training as mentioned.